Anas Handicrafts at Clover Center is a family-run furniture business, over 30+ years old. They have their own manufacturing unit for wooden furniture; some of which is on display at their showroom. From elaborate large pieces like beds, sofas, and cupboards, to knick-knacks, stools, and chairs – they can pretty much make anything you want, out of wood. After browsing through their store, here are a few budget-friendly items we found. De-stress yourself with a nice DIY back massage – we found multiple carved manual massage tools that are perfect for working out all the knots in your neck, back, and shoulders. Priced from INR 50 to INR 190, they’re pretty relaxing – and way more budget-friendly than visiting a spa. We found a variety of spoons and spatulas for INR 100 each, and rolling pins in two sizes, priced at INR 190/250. Made out of sheesham (rosewood), we thought they’d be useful and also easier to use on non-stick pans (as they won’t cause scratches). We also found a single wooden casserole-style serving dish, with a stainless steel interior for INR 2000. If you’re someone who has trouble finding your keys, then wall hooks are just what you need! There were really cute wooden carved wall-hangings in the shape of different fruits, veggies, and animals – with two to three hooks on each – priced between INR 120 to 150; also made of sheesham. If you want something a little more decorative, there were also mirror-versions of these wall-hangings, with more hooks on the painted, patterned frame, priced from INR 500 onwards. Never misplace your spectacles or sunglasses again, with this quirky nose-shaped spectacle holder! Made out of (you guessed it) sheesham, this ideal addition to your night-stand will only cost you INR 250. Anas Handicrafts has shelves and shelves of ornate wooden boxes, in multiple shapes and sizes. We really liked their quirky ‘puzzle’ pencil box – available in single-decker for INR 190, and double-decker for INR 350. That’s not all – we also liked a triple-layer folding jewellery box, which was priced at INR 1200. 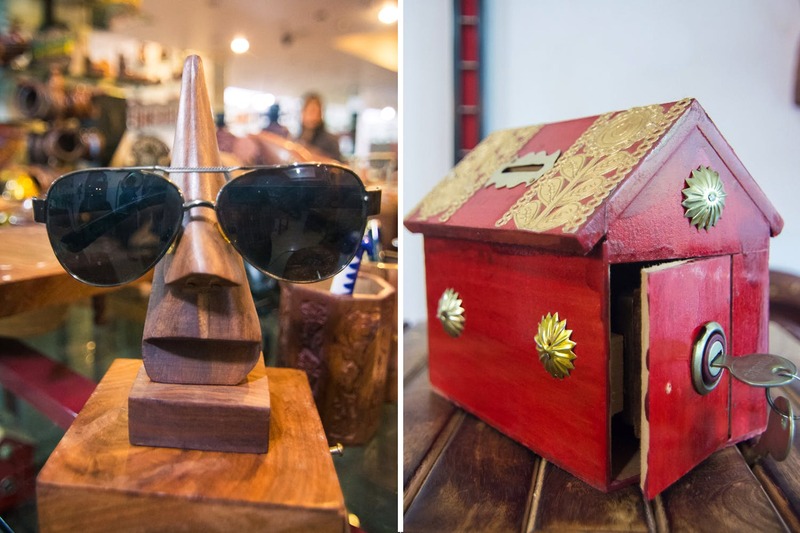 Save up for your next vacay with these cute little wooden money banks! Available in different shapes – a bottle for INR 350, house for INR 600, and a gas-cylinder for INR 750 – they’re perfect to lock away your savings for safekeeping. We really liked these small folding wooden stools, and think they’d be ideal space-saving furniture. Priced at INR 1600 each, they’re a little steep, but we think they’re nicer than plastic stools, and would be a cute addition to your living room or balcony.